question asked: Jun 30 '14, 8:55 p.m.
last updated: Jul 01 '14, 7:10 a.m.
Rafael Rodriguez Montes (208●12●74●148) | asked Jun 30 '14, 8:55 p.m.
Donald Nong commented Jun 30 '14, 11:33 p.m. 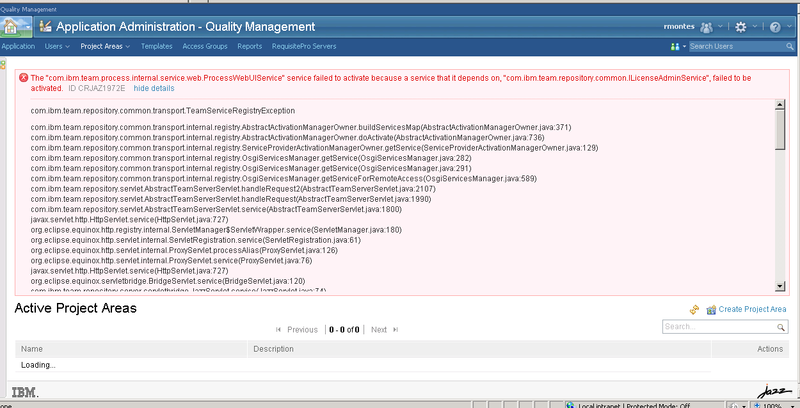 Please check qm.log and jts.log files and see what errors are there. Rafael Rodriguez Montes commented Jun 30 '14, 11:48 p.m. I'm getting error about the authentication, but when you use the upgrate-jts scritp should include the list of all apps already right? Rohit Balduwa (935●3●9) | answered Jun 30 '14, 11:50 p.m.
edited Jun 30 '14, 11:51 p.m. Although absolutely unsure but to me it looks like there are some issues with database connectivity. Check if the applications are actually connected to the databases. You can run "db2 list active databases" on the db2 server to see if there are any active connections exists on the application databases, specially to the JTS db once you login to jts/admin. - Please check the server and application logs. - Also, check whether the Registered application's are listing fine in the jts/admin page. - Do verify the licenses assigned to the user are now 5.0 licenses. Rafael Rodriguez Montes commented Jul 01 '14, 12:40 a.m.
CRJAZ2422E An error occurred finalizing the application migration. com.ibm.team.repository.common.TeamRepositoryException: CRJAZ2642E The migration cannot continue because the application being migrated is not registered with the Jazz Team Server that is being converted for use as the application database. any idea ho I can fix this? Rohit Balduwa commented Jul 01 '14, 12:54 a.m.
Verify that the server.webapp.url property in the teamserver.properties file for the application points to the public URL of the application. 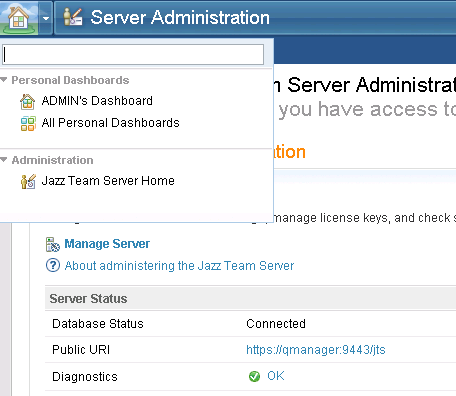 Verify that the Jazz Team Server database being migrated is the correct database with which the application was registered. Also,please run the diagnostics for JTS,CCM,QM,RM and paste the complete errors for each. - What is the database server and application server you using? - There is definitely some configuration issue in teamserver.properties file when connecting to the database. Please verify that too. 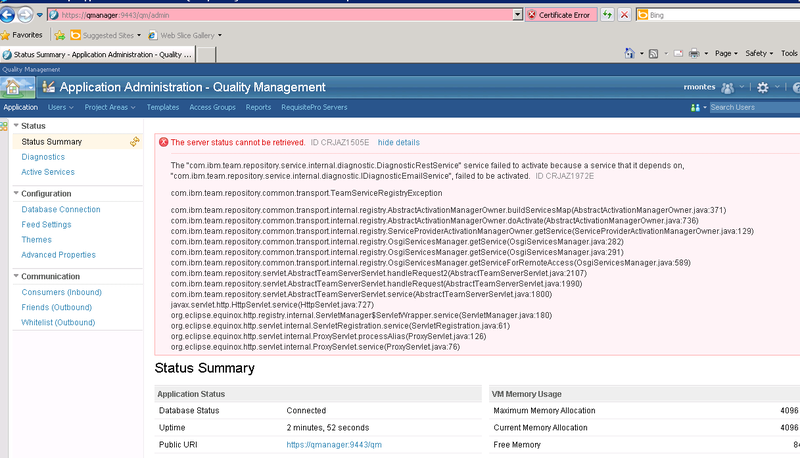 - Copy and Paste the complete error you get on qm/admin status summary page. Any errors you see for JTS , CCM and RM, paste those errors too. Ara Masrof commented Jul 01 '14, 7:10 a.m.
Is the the same Public URI value for your existing 4.x installation?